Okay Everyone. This is my mom's cookbook. You should all check out her website. It is the most beautiful cookbook ever! It's true talent and a lot, a lot of hard work compiled into one book. 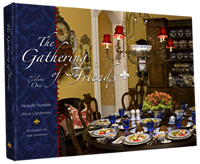 Check it out by clicking on www.thegatheringoffriends.com in my right column. We are having a lot of fun (and yes, of course more hard work!) promoting the book. Good Luck MOM!!!! so awesome to see Glenn Beck in an apron.. Your mom is lovely! Cool to see Abe's movie website too... You guys are GO GETTERS! Hope things in AZ are going well. Call me next time you're in Utah.. I havent see you and Abby forever!! Ooh- so excited to check this out. I already know it will be great since you always make the yummiest food and I'm sure u learned from your mom! My sis said you guys gave great talks today in church! Miss you guys. Hey Rach I started to buy the cookbook and then I thought maybe just maybe I could pay to have one with your moms signature! If its to much to ask I totally understand, I just thought I should ask. I loved going over to your house growing up she really did make the yummiest food and your guy's house was always so inviting! I miss your whole fam. Seeing the video with Abe and Ken made me remember some fun times growing up! It's so good to hear from you. I can't believe little Lezlee is in preschool...thats just crazy. Your mom's cookbook is so CLASSY, just like her. Well, I hope all is well in AZ. I am excited to keep in touch through blogging! I'm sure it is the best cookbook! My sister-in-law was looking through the Holladay 8th ward cookbook and was asking me who's recipe's would be good and I told her your mom's. I'll have to tell her about her cookbook! Hey Rach, I will look for her on studio 5 I watch it a lot. Just ask her about the book I just thought it would be neat to have, but I'm fine just ordering one to. I love to cook and we entertain A LOT! So this book is perfect! I can't wait to get a few as Christmas presents, I hope you still have some! Rach, where can i get your mom's cookbook? I am so happy she decided to come out with a cook book. I can't wait to try out all her amazing dishes. Hopefully I can make them as well as she does!! How is everything going? How is AZ?